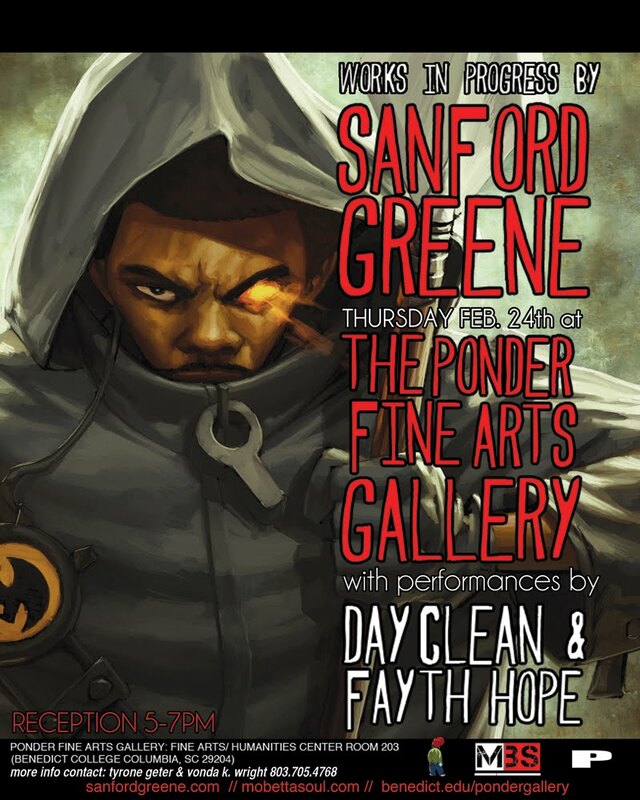 HeroesCon staple and recent Charlotte MiniCon guest Sanford Greene always has many diverse projects in the works. One of the most interesting is a Gallery exhibit of his art coming up later this month. If you’re in or around the Columbia, SC area, make it a point to stop by and check out some of Sanford’s energetic originals. The event takes place on Thursday, February 24 from 5:00 – 7:00 p.m. at Ponder Art Gallery at Benedict College in Columbia, SC. In addition to seeing Sanford’s art, the event will also feature music from DayClean (www.daycleanduo.com) and soul singer Fayth Hope (www.faythhope.com). The event is being hosted by Preach Jacobs (www.mobettasoul.com). For more information about the event, check out Sanford’s website (www.sanfordgreene.com). Don’t miss this opportunity to support a talented artist and longtime friend of Heroes. ← HEROES HISTORY: THESE TWO NEVER STOP TALKING!